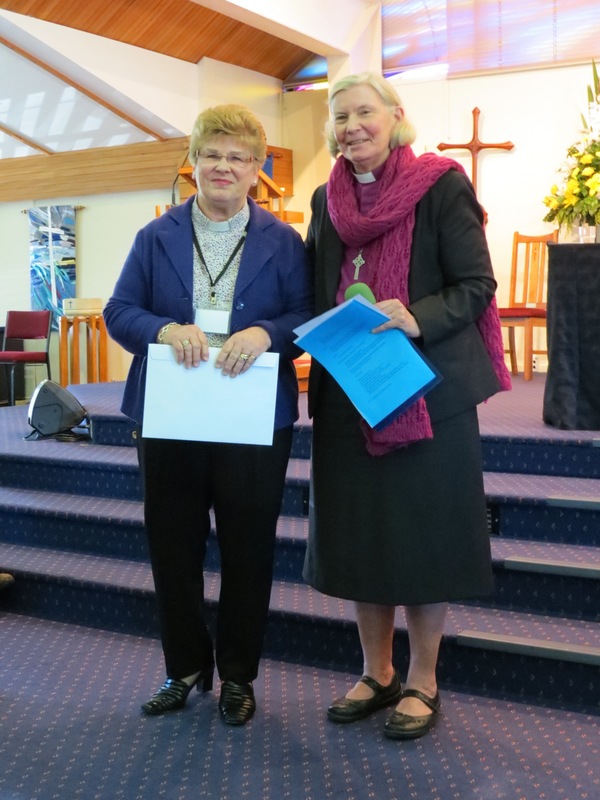 Last Saturday, our own Rev’d Lynnette Lightfoot was collated by Bishop Victoria as the new Archdeacon for North Canterbury. Members of Lynnette’s parishes – Amberley and Woodend-Pegasus – travelled to Christchurch to witness her accepting this role. The formalities took place during the Diocesan Synod at St Christopher’s Church, Avonhead, and was celebrated during lunch. May God bless you, Rev’d Lynnette, as you undertake this ministry over what is a fairly large geographical area — but at least the scenery is lovely on the journeys between parishes! This entry was posted in Anglican church, Clergy team, rural life and tagged Archdeacon, Bishop Victoria Matthews, North Canterbury, Parish of Amberley, Parish of Woodend-Pegasus, Reverend Lynnette Lightfoot. Bookmark the permalink.